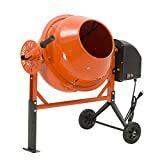 Power cement mixers are must have machines for the DIY enthusiasts. These versatile machines promote convenience by not only ensuring reliability but also saving labour costs. 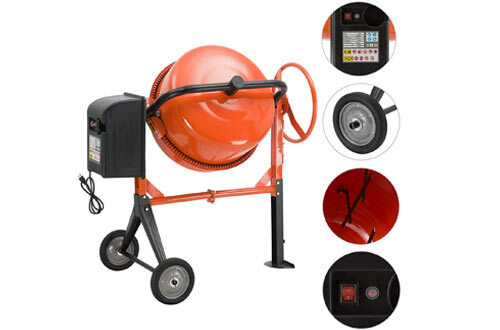 The best portable cement mixers are highly advanced, easy to use and smartly designed to deliver professional results. 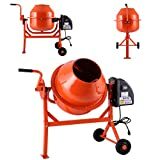 These machines are handy when it comes to mixing cement and concrete. This is because when mixing large cement batches, it becomes very viscous. This makes it hard to mix by hand. The machines are designed to mix the cement thoroughly and fast. By so doing, it ensures that you will get a good consistent, which is needed, for a strong finished product. Besides, some of these models come with an easy to clean drums. This means that you can also use them for other applications such as mixing feed for your cattle or seed inoculation. 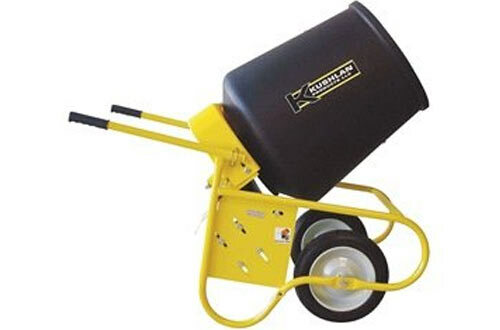 Completing construction work projects has never been easier with the JAXPETY portable cement mixer. Unlike most models that are gasoline powered, this an electricity-powered model that is not only efficient but also environment-friendly. It boasts of a sturdy steel frame and body ensuring durability. Additionally, this model also comes with heavy-duty rubber wheels making it easy to manoeuvre. 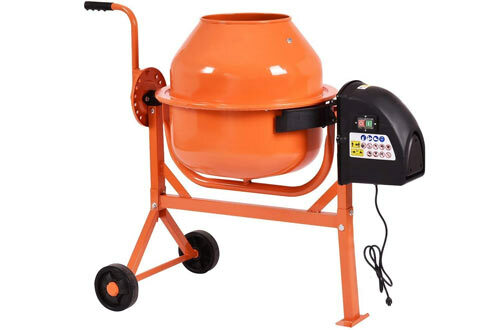 Going for the Goplus 0.5HP cement mixer will take your construction work results to the next level. 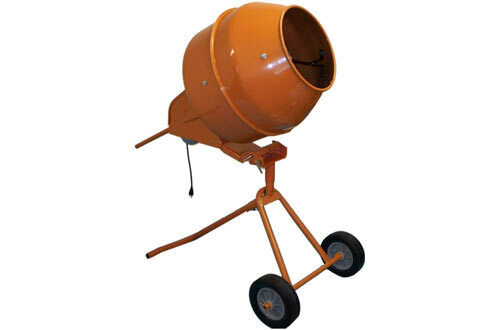 This is a 2.2cubic ft cement mixer that comes with durable construction, guaranteeing you with impressive results. The model comes with two wheels that allow for portability and strong stand for stability. 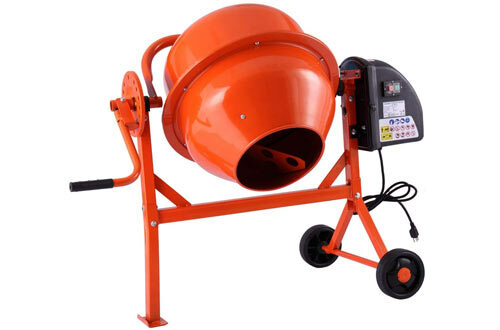 Additionally, this unit comes with a 0.5HP motor that ensures thorough mixing of the cement contents. 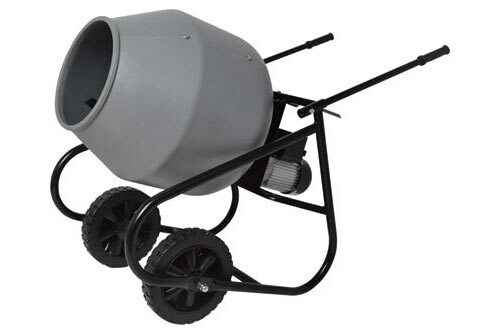 The SUNCOO concrete mixer is a durable, versatile, and portable product that handles mortar, stucco, and concrete. This machine can be easily rolled nearly everywhere thanks to its large wheels. 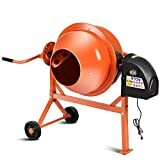 To ensure decent results, the mixer is crafted from solid steel and fitted with a heavy-duty motor that ensures high performance. 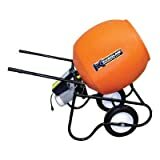 Besides using it in construction, this unit also makes a great choice for individuals looking to mix feed or seed inoculation. Built with the needs of Do-it-yourself in mind, the Kushlan KPRO mixer is a great choice for home use. 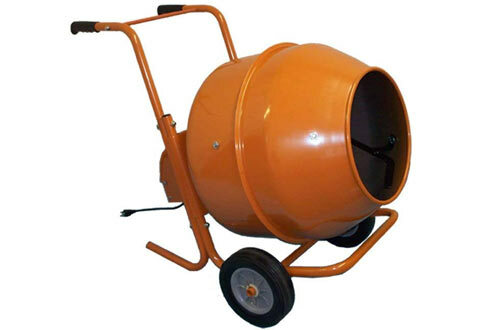 The unit has a decent capacity of 3.5cu ft drum that holds 180 pounds of premix concrete. The machine is also fitted with a 0.5HP electric motor that offers 21RPMs. Again, this model will not disappoint when it comes to construction. Thanks to the heavy-duty steel frame, this unit will withstand heavy-duty application without any problems. 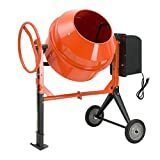 If you are planning a simple remodelling project, you don’t need to hire equipment or look for professional people to mix the concrete. 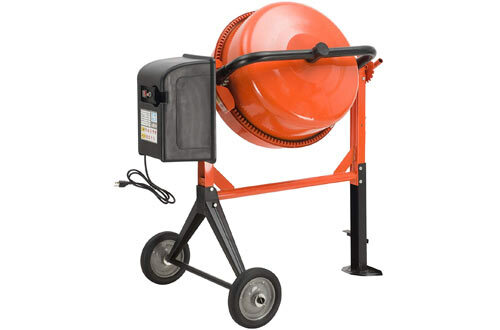 This is an inexpensive and simple to use the concrete mixer that delivers professional results. 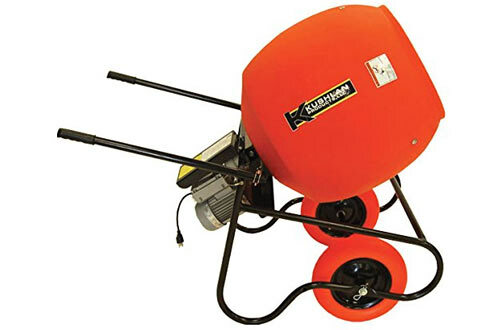 It boasts of electric driven motor with a fast speed of 28RPMS ensuring thorough mixing. Additionally, the drum is well lined, allowing you to clean it well after finishing your project. Hiring a concrete mixer machine will help you save more than having to hire personnel. 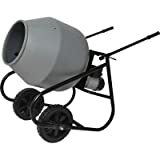 The Generic manufacturer concrete mixer is a portable 5cu ft mixer that you can use for various applications almost everywhere. We love the large drum capacity that gets the job fast. This unit also comes with large wheels making mobility fast and simple. Moreover, this unit comes with an all steel construction enhancing its overall performance and durability. 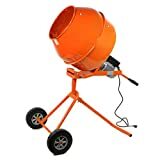 The XtremepowerUS concrete mixer is cleverly designed to allow you to meet your construction goals. It comes equipped with a powerful electric engine that is not only lightweight but also environmentally friendly. 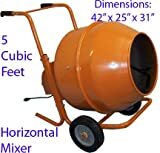 The mixer also comes with durable construction, making it convenient for various applications. Best of the entire unit comes with large wheels making it super easy to manoeuvre and transport. 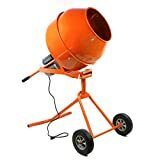 The SUNCOO 5CU concrete mixer is a perfect choice for individuals looking for a portable efficient and multipurpose mixer. This unit is made from sturdy steel making it durable. It also comes with a powerful motor and decent operation speed for improved stability and performance. Additionally, this unit comes with a large capacity drum, which is well lined. This makes it simple to clean after use. 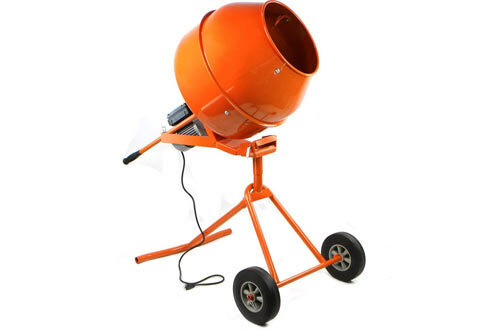 The Klutch 2cu ft cement mixer tops our list because of its numerous reasons. First, this is a budget-friendly choice making it affordable for most users. It also comes with a decent drum capacity making it perfect for various applications. Another feature that makes this unit stands out it the easy to clean drum. This means that you can use it for construction as well as mixing feeds for your herd.